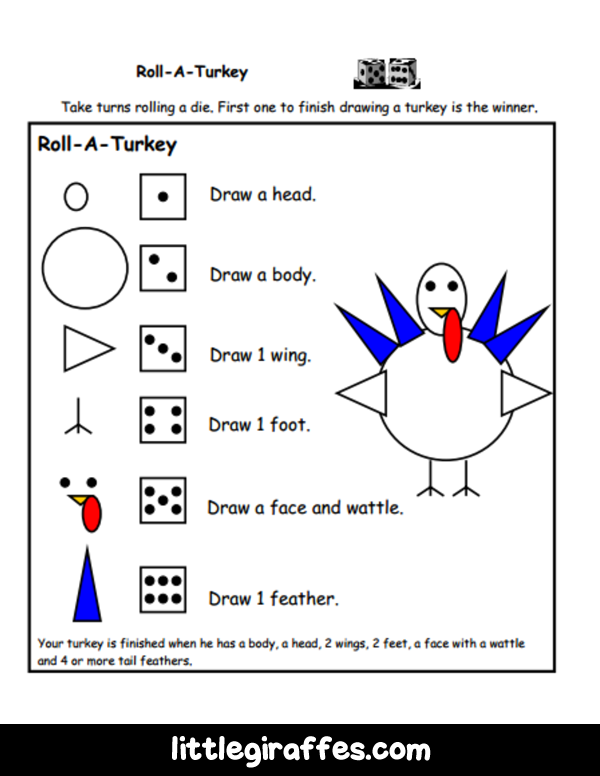 You can grab the Roll a Turkey game from the Printables @ A to Z Teacher Stuff. This printable also includes a dotted head and body. This would be helpful for the students if they roll a 3, 4, 5, or 6 before they’ve drawn the turkey head or a body. It gives them a point of reference to draw their own wings, feet, face and feathers. Have children make corn counting books by gluing corn kernels on pages that have the numbers 1 through 5 written on them. Use several varieties of dried beans and corn (or Indian corn) kernels to create patterns. Give each child a large needle and heavyweight thread to string popcorn and cranberries in a pattern. Hang the strings outdoors in trees for birds to eat. Create a class graph by letting children select their favorite food, such as turkey, stuffing, potatoes, cranberries or pumpkin pie. At this time of year you can buy those cans of popcorn with 3 different flavors of popcorn in them. Taste each flavor of popcorn and graph the results. Use the popcorn bag picture on http://www.abcteach.com for them to color and label with their favorite kind and then do a graph on the floor. After Thanksgiving at home or a school feast, create a class graph by letting children select their least favorite (I Didn’t Like It) food, such as turkey, stuffing, potatoes, cranberries or pumpkin pie. Color the turkey’s eyes the color of your eyes. Now, cut out the turkey and glue it on a piece of construction paper. Choose your favorite color of paper. Color and cut out the feathers. You will need the same amount of feathers as your age. Put these turkeys on the bulletin board and post this note to ask visitors to locate a student’s turkey from the clues. Can You Find My Turkey? My favorite color is _______________. I ____________________ to eat turkey. I am ______ years old. 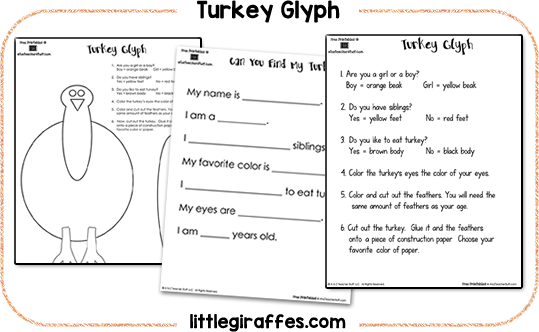 You can find a printable turkey and another turkey glyph idea here. Do You Like The Butter We Made? 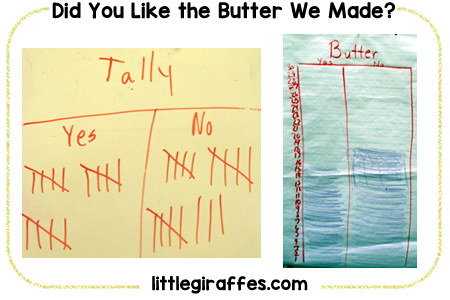 After shaking cream to make butter and tasting it, we used tally marks to count the number of children who liked the butter and the number who didn’t like its taste. Then we converted the tally marks into a graph. Incorporate a plant/seeds unit by planting a corn seed, popcorn, and candy corn. Make predictions on what will grow and then watch their progress! Some kids will actually think a candy corn tree may grow from the candy corn. After a few weeks make a Venn diagram comparison of between real corn and candy corn. Put an ear of corn in a pot filled with potting soil half covered with the soil. It will grow. Be sure to use field corn or Indian corn. Or just take an ear of Indian corn and place it in a pie tin with water. The kernels of corn actually start growing! This was an idea from Sharon in Florida. Nine classes combined to create a student-formed Mayflower. Line up 2 rows of boys to be the boat. If you have an odd number of boys, let the odd one be the front of the boat. Have each set of 2 boys (standing side-by-side) lock opposite arms from boy 1’s shoulder to boy 2’s shoulder. Then each boy holds onto the shoulder of the boy directly in front of him. THIS MAKES THE MAYFLOWER BOAT. The girls in your class are the Pilgrims. Have the girls crawl under the archway the boys have made with their arms. They will be inside the boat. Then the sea gets a LITTLE ROUGH and the “Mayflower” GENTLY rocks back and forth. The boat can move VERY SLOWLY FORWARD so the “Pilgrims” have time to move up too, going to America. Then the “Mayflower” gently bumps into PLYMOUTH ROCK (a cabinet, chair or table from your room). The “Pilgrims” get off (crawl out from tunnel made by boys archway). The boys then become the Native Americans and greet the Pilgrims. THEN ALL CHILDREN PLAYED ON THE PLAYGROUND. 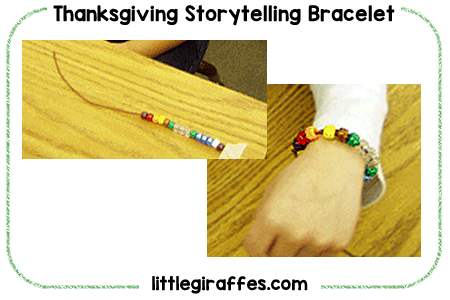 I have a printable page for this First Thanksgiving Storytelling Bracelet at A to Z Teacher Stuff if you’d like to print this off for use in your classroom. 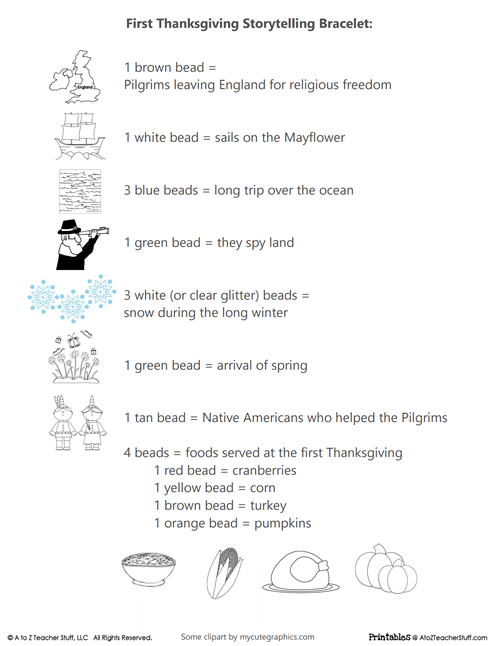 Use these colored beads to retell the story of the first Thanksgiving. Is there another link for the turkey glyph pattern, other than the link listed above? It opens as a writing activity. Thank you! Thanks for pointing that out! It looks they redirected that link to a different printable. I’ll see if I can find something else and update the page.